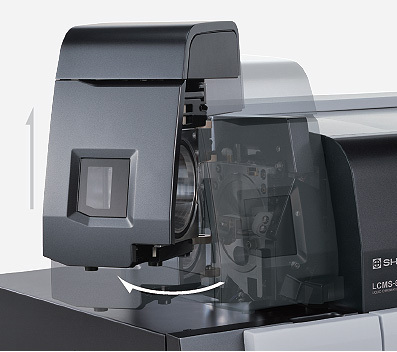 In addition to speed and sensitivity, Shimadzu designed the LCMS-8050 for robustness to meet the most demanding laboratory requirements and most difficult matrices. The figure below plots the area results from 1000 consecutive analyses of a deproteinized blood plasma sample spiked with alprazolam. The LCMS-8050 achieves excellent reproducibility with a 4.59 % RSD for the area results over the 1000 analyses. As with Shimadzu’s other triple quad systems, maintaining the LCMS-8050 is simple. Replacing the desolvation line (DL) and ESI capillary is quick and easy. Additionally, the design allows users to replace the DL without breaking vacuum, providing greater uptime and usability.